Doesn't a good, hearty breakfast get your day started on the perfect note? The sun shines brighter, the flowers look prettier, & even the radio songs (the same ones you've listened to a thousand times before) sound sweeter. One of my favorite breakfast is a helping of hash brown & eggs with a cup of hot aromatic coffee. I knew how to create a Hash Brown basket with other fillings (which I will be posting later), so when I saw pictures for Eggs in Hash Brown Nests floating around on Pinterest, I loved the idea of combining two of my favorite breakfast items & just had to create my own version. And, oh boy! 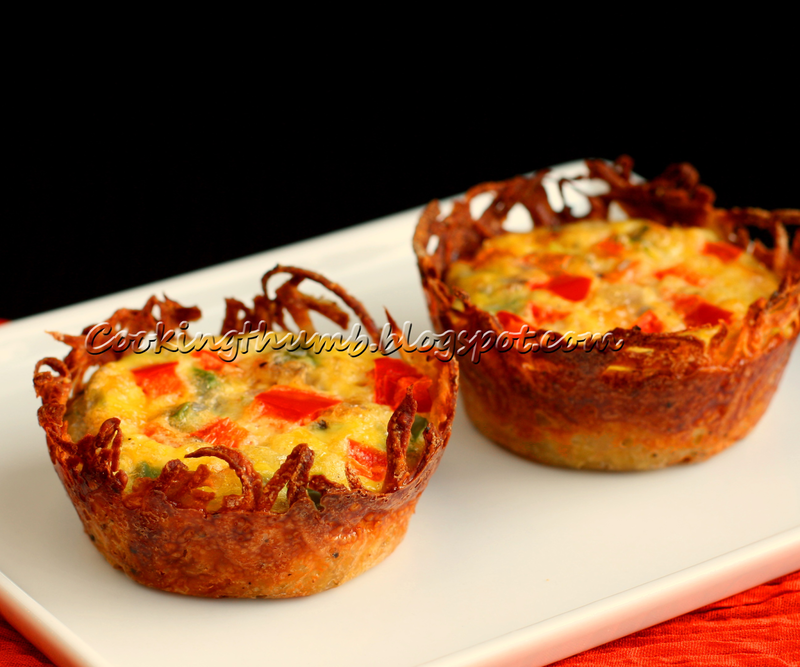 what a delightful outcome :) The crispy potato basket with the spongy mixture of eggs, veggies & cheese is a mouthwatering combo - it makes each bite a scrumptious medley of morning flavors! Generously spray 6 muffin cups of a regular-size (non-stick) muffin tin with olive oil & set aside. Using a food processor with grater attachment or using a box grater, grate the potatoes & transfer them to a bowl. Sprinkle with salt, mix & let it sit for 10 minutes. Put the grated potatoes in a cheesecloth or a clean kitchen towel and squeeze to remove the excess water. Transfer the dried, grated potato to a large bowl. Add garlic powder, black pepper and oil & mix until combined. Spoon about 2 tbsp of potato mixture into each muffin cup. Press the potatoes into the bottom & sides of the muffin cup to form a basket. When lining the sides make sure that the potatoes go all the way to the top of the muffin tin, & a thin layer covers the bottom. Bake for 15-20 minutes or until the top edges turn light golden brown. Meantime, beat the eggs in a medium-size bowl. Add salt, black pepper, cheese, red & green pepper, onion and green chillies & mix until combined. Set aside. Remove the potatoes from the oven & fill each potato cup 3/4 with the egg mixture (about 3 tbsp). Return to the oven & bake for 20-23 minutes or until eggs are fully cooked. Allow to cool for 5 minutes in the pan. Run a knife around the edge of each hash brown nest & gently remove it. Serve immediately.